Last week I had a first. Get your mind out of the gutter! I was talking about my very first professional fotball game. 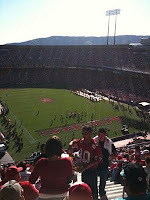 We had a group of about 20, and all of us congregated at Candlestick Park for a little tailgating and football. We were told by the organizer that we needed to be at the park at 9am. We were not to be late. Well, a few of us arrived on time. The organizer, not so much. But it was ok, it meant more Bailey's and coffee, and then mimosas, for us early birds. It also meant we got to enjoy the sunshine a little longer! been about 70 degrees F, and none of us were prepared for this heat. I personally had a few layers of clothing on, with several more layers waiting in the car. My friends were similarly dressed, adding Uggs and other boots to the mix to keep their feet warm on what was supposed to be a cold day. Needless to say...we were melting out there. 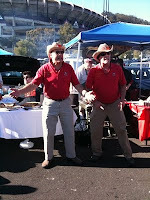 We ran on a little long at the tailgate; it was hard to tear away from guys like the ones in the picture (they performed several ditties for the crowd, all about the 49ers, to the tune of Mambo #5 and other fantastic songs). And, outside, the beer was a lot cheaper than the beer inside the stadium. But eventually we did make it in. Our seats were up there, but it was still fun. They were in the sun the whole time, so it required us moving a few times down to the shade near the concession stands. A few guys in the group also decided to go shirtless, which was an interesting choice since 1. we had no sunscreen, and 2. their chests hadn't seen the sun in quite some time. But they all survived! It was a really fun day. The 49ers won, which was good for those in our group who are fans (growing up, after the Raiders moved, most of my family cheered for the 9ers, which meant I cheered for whatever team was playing them, because someone had to. And the Bears, always the Bears.) I am looking forward to getting to go to another game someday; hopefully it won't take decades like it did this time! I really only opened the post becaues my mind was in the gutter...sadly to say I was a tad let down that the story wasn't more scandalous, but still love ya!